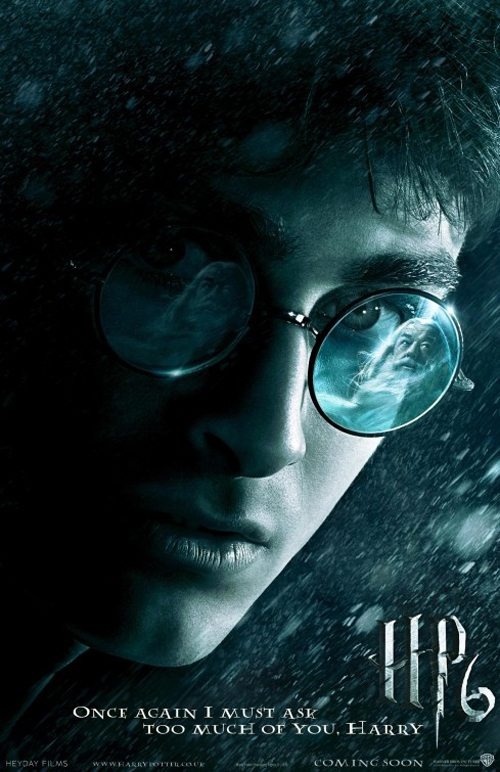 The latter element initially looks as if it may end up treading water, as much as the similarly positioned romantic tuggings in Goblet of Fire did, particularly as Ron finally gets his extended, devoted subplot focussing on unwanted admirer Lavender Brown (Jessie Cave) and his feelings of insecurity as a Quidditch goalie. I’ve said before I find it difficult to swallow Hermione’s interest in Ron, particularly when it isn’t played for “But why should she be interested in me?”, and that hasn’t gone away here, but these sequences bring out the best in Grint, whose delivery is as innately humorous as ever. And, while Rowling’s use of the old placebo trick may not have anyone in the audience fooled, it’s a nicely placed lesson nevertheless. Even more so, and perhaps more surprisingly so, is Harry’s own romantic longing, first identified when he’s asked out at London café by Elarica Johnson (a date never to be met) and then when he finds himself pining for Ron’s sister Ginny, who had previously made her interest known as far back as Chamber of Secrets. What sells this isn’t Radcliffe, though; it’s Bonnie Wright’s nuanced, subtle performance, one that seems entirely of a piece with the more mature, subdued approach returning director David Yates brings to the adaptation (Steve Kloves is back as screenwriter after his one sickie from the series). That said, Radcliffe, who continues to be as generally stiff as we’re now used to and have come to terms with, reveals a hitherto unexplored trick to his limited arsenal; he’s remarkably good at playing stupid/gormless/off his gourd (see also Swiss Army Man). It may be a Channing Tatum thing, where an actor’s wooden unless you cast them just right, usually as someone oblivious or vacant. The entire sequence revolving around his consumption of liquid luck succeeds every bit as much due to Radcliffe’s woozy, out-of-it act as the increasingly intoxicated performances of Robbie Coltrane and Jim Broadbent (booze plays a recurring part of the movie, so one presumes Rowling intended it to reflect a rite-of-passage for this particular age group). He also musters a genuine laugh with his cheeky “I am the chosen one” in response to Hermione telling him a girl is only interested in him due to his foretold status. Additionally, Harry has a more interesting role than usual in Half-Blood Prince. Rather than being constantly hearkened to as important (except in respect of Romilda Vane’s attentions), he’s employed as a spy, on a mission from Dumbledore to discover new Potions master Professor Slughorn’s (Broadbent) secret knowledge of Tom Riddle. 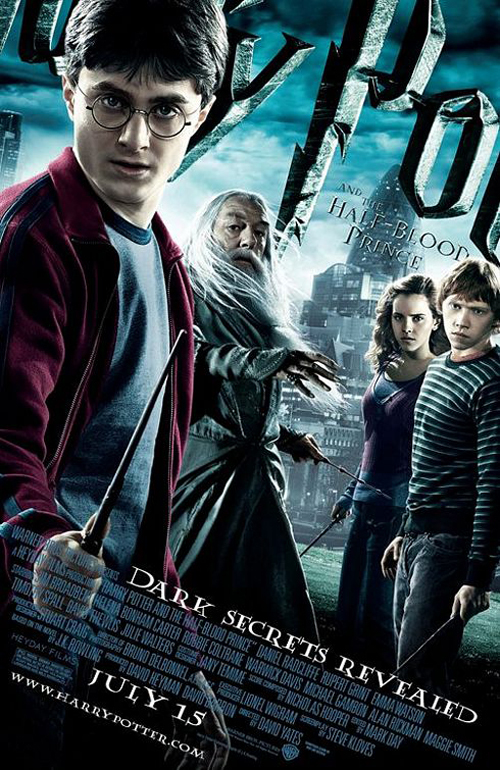 Harry Potter here shows its potential for shifting subgenres within its own genre, deftly adopting the slow burn of a political thriller (“Did I know that I just met the most dangerous dark wizard of all time?”), with flashbacks, muddled accounts and incomplete snippets of information (“This memory is everything. Without it we are blind”). That Harry is fairly useless at being an undercover agent is part of the appeal of the take. And, unlike earlier instalments, Kloves continually juggles the elements of intrigue without dropping them or having to push them into sharp retreat. One of the most satisfying is the Half-Blood Prince’s book of spells. It’s in the title, so we know it’s essential, and particularly so as Harry’s using it throughout to get ahead in class, but it steadfastly refuses to become the most important element until we realise it is at the climax, when we learn it was Snape’s book, and his alter-identity. “Revealing” Snape, now Professor of Defence Against the Dark Arts, so his end in one way or another cannot be far off, as the bad guy, the character on whom suspicion has fallen since the very first film due to his undisguised disdain for Harry (based on how it reflects on his own personal history), is convincing enough without ever being convincing (because Dumbledore would have to be wrong, and because all the obvious hints that this is a ruse between two conspiring participants would be void). More, as I see others have drawn observed, Snape’s role now offers a crisp analogy for the gnostic Judas (notably in The Gospel of Judas), I suspect intentionally on Rowling’s part, whereby the thirteenth disciple followed a course pre-determined and agreed with Jesus that he should betray his Master in order that the latter fulfil his role on Earth and become the saviour of mankind. Rickman, of course, is iconic in the role, and I particularly liked the manner in which Snape casts spells like a priest engaged in an exorcism or performing some other holy rite. This is also easily the most interesting Dumbledore movie (unless Jude Law proves otherwise), finally giving Michael Gambon a chance to justify the necessary recasting of Harris, because he’s allowed to cast off the benevolent mentor and get his teeth into some actual acting, be it the scenes at the cave where he must drink the potion concealing the Horcrux (a sequence that evokes the tribulations of Greek labours while filled with unsettling imagery, from zombie-esque Inferi to Harry – unlike later – bowing to his elder’s instruction and making him drink up that liquid badness). Yates has made a subtler, more lyrical Harry Potter than we have seen before; as much as Aflonso Cuarón’s picture is artistically superior, it lacks this one’s overall resonance, of loss and fateful, world-changing events both large and small (mostly on a more immediate, personal level). Much as I disapprove of the colour-drained palate Yates seems to prefer, it admittedly suits the generally downbeat, sombre tone, as if pre-rehearsing Tinker Tailor Magician Spy. There are some lovely transitions, from pages to snowscapes, and swirling images breaking out from the pensieve as we return to present reality. Or just plain memorable ones, such as the incongruous meeting of magicians in a bedsit, and the chase through a cornfield at the Weasleys’. Not everything works. After making a strong impression in the previous entry, Luna is now clearly just space cadet comic relief. Draco meanwhile, despite being nominally shown not to have it in him to be truly evil – but we knew he was just plain bad at bullying anyway, right? It has been hammered home in the most cartoonish fashion in every preceding movie – is again a disappointment, the series biggest missed opportunity. There could have been an attempt to sketch in a layered character, but the few suggestions now are too little too late (we come away thinking he’s not only hissable but entirely useless too). But mainly, this is a highly commendable success. I’ve had to rethink my previous assertion of obviously the best Potter (Prisoner of Azkaban). I think it might instead be the Harry Potter and the Half-Blood Prince. It’s just a shame the two-part ultimate chapter wouldn’t even come close to equalling it.